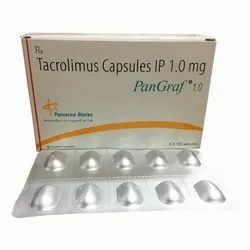 Pioneers in the industry, we offer resof, sofosbuvir plus velpatasvir tablets and pangraf 1 mg from India. The drug is an inhibitor of the viral polymerase NS5B and suppresses the replication of the virus of hepatitis C. Sofosbuvir is used for the treatment of chronic hepatitis C as a main component of antiviral therapy in adult patients in combination with other drugs. Clinical data confirm the high efficacy against 1, 2,3 and 4 genotype of hepatitis C virus Data on the effectiveness of the drug in patients with common hepatitis infection and no HIV. 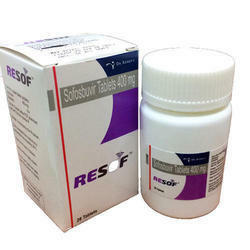 Buy Sofosbuvir 400mg Price Online from India approved for use in combination with other antiviral agents for the treatment of the first, second, third and fourth genotypes of hepatitis C virus in adult patients. The drug is taken once a day in a dosage of 400 mg (1 tablet). The pill is better not to chew, as it has an intensely bitter taste. The medication is best taken during meals, drinking plenty of water. Take the drug daily, at the same time. In General, the drug is well tolerated and has no pronounced side effects. The most common of these is fatigue, headache, and nausea. The severity of adverse effects is increased with combination therapy with interferon and other antiviral drugs. In case of hypersensitivity to the active substance. These groups of patients should not undergo therapy with Sofosbuvir, as clinical trials for these groups was conducted. Women of reproductive age should take the drug with caution because at the moment the effect of Sofosbuvir on the reproductive function is still unclear. Elderly patients and patients with renal and hepatic insufficiency should be treated only under careful medical supervision. For mild renal and hepatic insufficiency, a dosage adjustment is not necessary. The drug is used in combination with other antiviral drugs only when the efficiency exceeds possible complications. The drug should not be combined with Boceprevir or Telaprevir. At the therapeutic dose of 400 mg per day the drug does not affect the duration of the QT interval and cause of disorders in the cardiovascular system. During treatment, refrain from activities that require a speed of reaction and attention. 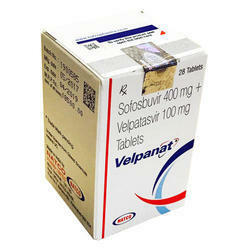 Buy Velpanat Tablets online Price from India medicine is a combination of Sofosbuvir and Velpatasvir. This medication work by decreasing the quantity of hepatitis C virus in the human body, which helps your immune system fight the disease and might assist your liver to regain Velpanat made by Natco Pharma Pvt Ltd, is a combination of Sofosbuvir 400 mg and Velpatasvir 100 mg tablets. Talk about this HCV medication with others for whom it wasn’t prescribed. Velpanat is a direct-acting anti-inflammatory (DAA) medicine. DAAs are a group of drugs that immediately block the capacity of the hepatitis C virus to produce copies of itself. These medications work by weakening the action of proteins required by hepatitis C.
Natco Pharma Pvt Ltd Sofosbuvir and Velpatasvir can be used as a treatment for chronic long-term hepatitis C, a viral disease} of the liver. It might occasionally be utilized with another medicine (ribavirin). Velpatasvir works by interfering with a protein required by this virus. Together both of these drugs greatly reduce and then stop the creation of fresh copies of hepatitis C viruses. Common Side Effects Velpanat Tablets: Illness; A headache; Diarrhea; Insufficient desire; Tiredness; Feeling sad or empty; Rash; Trouble sleeping; Lack or loss of power; Trouble concentrating; lack of interest or enjoyment; Irritability; Discouragement etc.. Severe Side Effects Velpanat Tablets: Chest pain or distress; Shortness of breath; irregular or slow heartbeat; Unconsciousness; Lightheadedness; Dizziness or fainting; Unusual fatigue etc.. Inform your healthcare provider if you have some negative effect that bothers you or that does not go away. These aren’t all of the potential side effects of the hepatitis medication. To find out more about potential side effects of Velpatasvir 100 mg & Sofosbuvir 400 mg, browse the medication label or package insert or speak with your healthcare provider. Patients should correctly store the medication to maintain its efficacy and quality. Following storage directions will be beneficial in keeping the drug at the very best of manner. Store it in a cool and dry location. Improper storage can influence the potency and shelf lifespan of your medication. Maintain Velpanat from the original bottle with the tag attached along with also the child-resistant cap secured. If you are driving, You Might want to have specific medications at hand, however, do not store them in the glove compartment, where they could be damaged from the heat, cold, or rain outside or from the car’s heater or air conditioner. Do not keep Velpatasvir & Sofosbuvir in the glove compartment of your car. Medicine can get too hot, cold, or wet there. Keep your medicines separate from those of your spouse or other family members. This will make it less likely that you take the wrong ones by mistake.